because Dubbed got some of the worst reviews ever, if you play on watching this anime you may want to watch this subbed. 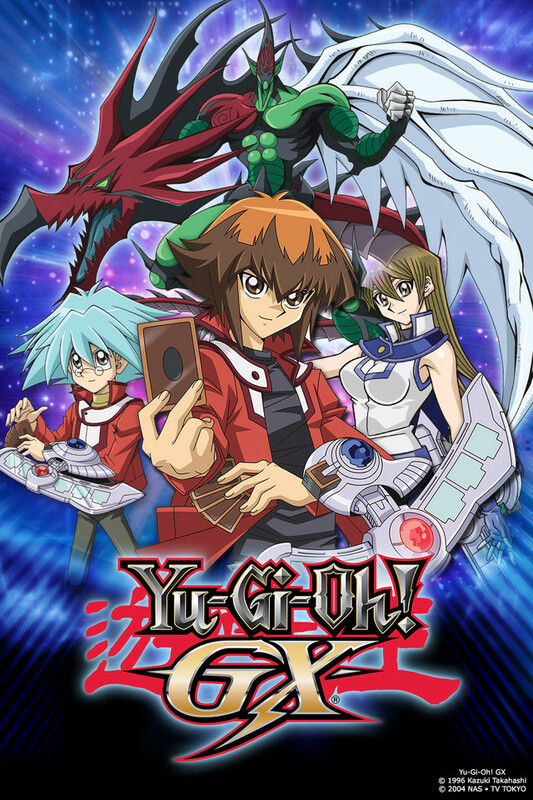 If you are new to this anime and are not a fan of the original Yu-Gi-Oh Series than this anime may not interest you as much, if you however did watch the original series what I can let you know is this anime becomes much much better in Season 3-4 and if you enjoyed the first two seasons that you should definitely continue watching as the ending is very enjoyable. This like was for many people their Yu-Gi-Oh show while growing up. GX is the best series as it not only is the funniest, but had some of the most intriguing story arcs of the franchise such as the Shadow Rider Arc and the Light of Destruction Arc. The characters are all fairly likable and the protagonist Jaden has one of the funniest personalities as well as an extremely fun deck (who didn't like E-HEROS?) It is also a good balance when it comes to the card game as it is modern enough compared to the original series, and yet it does not go overboard like 5D's felt with Synchros. Definitely a must watch. Also, I know this might be an unpopular opinion and 4Kids isn't known for their dubs, but I felt the English dub for GX was terrific and definitly reccomend it for anyone's whose mother language is English. The one liners and trash talking is hand down on point and killer and makes the show that much more enjoyable. Along with Cardcaptor Sakura, Sailor Moon, Inuyasha, and Tokyo Mew Mew, the Yugioh franchise was the start of my beginnings as a fan of anime. The original, GX and 5Ds are still very special to me, even though now they are pretty old. Yu gi oh GX takes place a number of years after the first series (Yugi is an adult at this point). The story follows Judai Yuki (known as Jaden in the english dub) as he goes through his years at Duel Academy, a school founded by Seto Kaiba and is funded by Kaiba Corps. The majority of the series is mostly fun, and humorous, taking serious turns here and there. However, the third and fourth season are the more story oriented parts of the series, and the more intense and serious scenes. One of the main points in this series is the character development. Unlike the original Yu Gi Oh, the characters in this series (specifically Judai and Ryo, a friendly rival at the start of the series) change in the mind. GX loves the idea of characters's minds getting played and having their perspective turned upside down, so much that they can start from being a happy kid and turn into a serious, unloving person. For most of the characters, this happens in the third and fourth season. The only really big downside is the animation, which can be pushed off since this was released almost ten years ago. As for dub vs sub, I suggest sub if you are watching this spinoff for the very first time. It's hard for some people to switch from dub to sub (since theres no dub for the fourth season due to the bad reviews plus a character cussed in the dub lol). I like the dub since its what I grew up with, but its really on personal preference. I watched GX dubbed as a kid and I liked it so I thought the show was fine. But after rewatching it, I realized I was wrong. I'll ignore the overarching plot as it's obvious the staff had no real plan as it was the first spin-off and the pacing as this was made the early 2000s. But at the same time, the staff obvious had no care for the characters as a whole. Thus why the main cast post season 1 are handled poorly. Season 2 they were brainwashed, killed in season 3 and killed again in season 4. The filler is ridiculous and obvious done to waste time. Plot points are brought up and dropped and most relationships are at best shallow. Judai is the worst in this regard as he takes the lionshare of the screentime even in season 1 which just gets more ridiculous as the show continues. He's a self-centered and lazy who is loved by the staff and thus the world. His "development" is forced and pointless. Season 3 runs on "dark is deep" mentality as it's a mess if you look at it as a whole and season 4 is worse. This series is good for kids. I remember loving it as a kid. However, now it doesn't seem as deep as it was before. For example, the dialogues between the characters feels childish, and Jaden's character swings a lot. So if I could I would rewrite the whole series and make it more adult. Otherwise, I still love the duels so much. The duels won't even be touched. This has to be one of my favorite in the franchise do to all the hype that it brought along and after 4kids cancelled the series, makes me want to watch it again. The characters a re unique and sure there are some funny arks and then there's the whole story that's shrouded in mystery. Yet the show isn't afraid to make fun of itself and its interesting through and through. Now it's time to get your game on! After the original Yu-Gi-Oh!, we got the very first Yu-Gi-Oh! spinoff. Yu-Gi-Oh! GX. Jaden Yuki is a likeable protagonist who sleeps through class at Duel Academy but is great at dueling. The series starts out OK but it gets better as the series goes on. My personal favourite season is Season 3 as it gets a bit darker and is the turning point of the series. The bad news is that the dub of GX is incomplete and stopped at episode 155 making us all think Jaden got sent to the stars (died) and left episodes 156 to 180 undubbed. I'd like to see 4K Media go back and dub those episodes, but if GX were to have a complete dub, it would have to be an uncut dub done from scratch. I recommend you watch the original Japanese version with subs to get a better experience. The subbed episodes are mostly based on the Japanese DVD release except for episodes 111, 117, 118, 120, 126, 128, 130, 136, 144 and 175 which use the original TV broadcast. So if you haven't already, give GX a shot. It's got likeable characters, nice duels and good story arcs.